Combining ideas from Wagner and Schuré with his own doctrine, [Rudolf] Steiner produced the Mystery Plays, which were to become the focal point of activity at Dornach and have remained in the anthropological repertoire to this day. These plays, which trace the spiritual evolution of the same characters through four stages (a fifth was never written), combine the arts of speech, movement, colour and design in a Wagnerian synthesis which is given a new twist by Eurythmy. Steinerial Eurythmy (as distinct from Dalcrozian Eurhythmics) is define as visible speech and song; it is based on the idea that we are affected not only by the sense of words but also by their sound. This sound is produced as invisible waves disturbing the air, and the waves can be translated into visible shapes, resembling the lines of force embodied in Steinerian painting and sculpture. But words also signify something, and the shapes can therefore be used simultaneously to articulate meaning. Yesterday’s question of ‘Was Wagner a Sufi?’ leads to that passage from Peter Washington’s survey of spiritualism Madame Blavatsky’s Baboon. Wagner's notion of “universal currents of Divine Thought vibrating the ether everywhere and that anyone who can feel those vibrations is inspired” has been accepted since it was first propounded by al-Kindī in the ninth century, but has fallen out of favour in our binary age. But some free-thinkers have not rejected the notion, and the teachings of Rudolf Steiner are a major influence on the contemporary composer Jonathan Harvey. 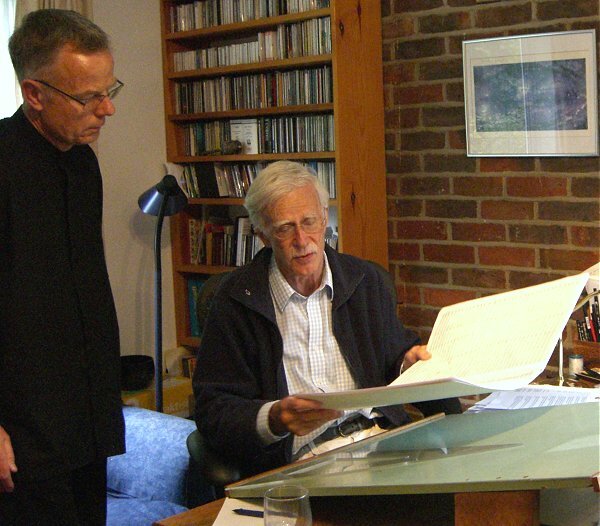 Increasingly Jonathan Harvey is categorised as a ‘mystical’ and ‘spiritual’ composer, a misconception aided and abetted by his recent compositions such as Weltethos which veer perilously close to the syncretic doctrine of Theosophy embraced by Madame Blavatsky and, for some years, by Rudolf Steiner. But pigeon-holing is dangerous and some of Jonathan Harvey's most important compositions explore sound as an abstract rather than spiritual medium. In his 2010 radio interview with me – see photo above - Jonathan talks about his fascination with Rudolf Steiner, and provides a priceless commentary on his orchestral composition Speakings which uses electronics to transform words spoken by the musicians into sound shapes. There is more on that interview here and it can be heard via this link. There is no accepted explanation for water-divining, other than that it appears to involve a physiological reflex within the dowser, reacting to some impulse from what he is dowsing for, or possibly sending out an impulse towards it. C. returned to Santa Cruz, shaken to the core. Nature was showing him things he had not known existed. It had waited until the defences of his reason were lowered before rewarding him this privilege, to possess a sympathetic magic over its most precious creation.